It's such a good feeling to have supersoft clothes with out the strong perfume smell many over the counter softners contain. Shaklee has just introduced a new special plant-based ingredient that adds extra softness to fabrics and to top it off it's HE compatible and biodegradable! 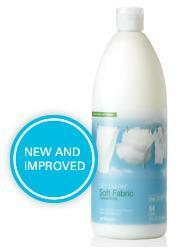 Get clean-smelling, silky soft clothes with Get Clean® Soft Fabric Concentrate. This new and improved HE compatible formula, with a special plant-based softening agent, delivers even more softness while reducing wrinkles and static cling. Shaklee Get Clean products are safe, powerful, green and smart. As always, this biodegradable formula is concentrated and made with sustainable ingredients from natural sources. It contains no phosphates, nitrates, borates or dyes. Get Clean Soft Fabric is great on fabrics and better on the environment, with extra softness everyone will love. •Perfect with Get Clean Fresh Laundry Concentrate and Get Clean Soft Fabric Dryer Sheets!